Agricultural aviation consists of small businesses and pilots that use aircraft to aid farmers in producing a safe, affordable and abundant food and seed supply. Aerial applicators are highly trained and, like all Americans, concerned with human health, the environment, security, and performing their job in a responsible manner. According to NAAA in 2012, agricultural aviation accounts for almost 25% of commercial crop protection applications – resulting in the aerial treatment of about 71 million acres annually. It is the safest, fastest, most efficient and most economical way to treat a crop when pests or disease threaten. Agricultural aviation assists in providing a safe, affordable, and abundant supply of food and fiber for the world’s growing population and is vital in the prevention of forest fires and public health threats, such as in the eradication of mosquitos and other disease-carrying insects. Aerial application is a crucial component of high-yield agriculture and benefits the environment by producing maximum crop yields from fewer acres. 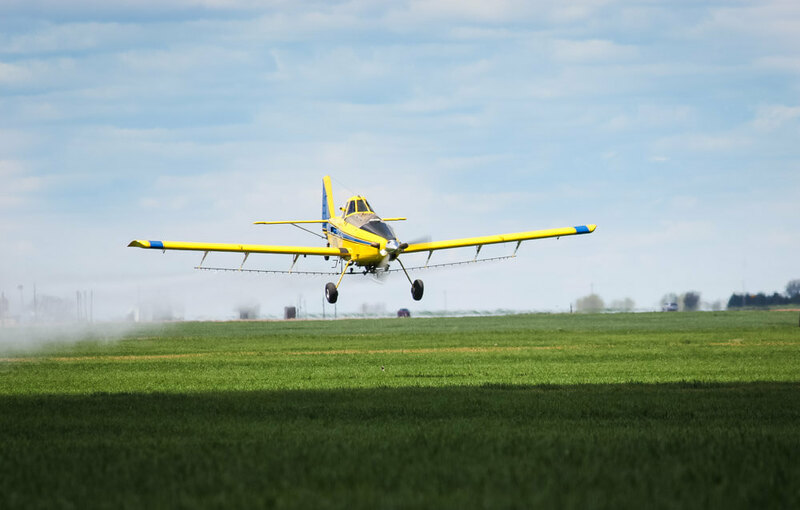 Although ground application is also an effective method, using an agricultural plane to spray is more efficient when fields are wet and when crop canopies are too thick for ground rigs. Technology exists today that combines GPS units with GIS software capabilities and the variable rate flow controller to allow the product to be applied in varying dosages according to what the condition needs are in the field and targeting the material to be delivered only where it’s needed. Tyree Ag operates two turbine Air Tractor airplanes with GPS guidance systems that include key features like moving map displays, flow controlled dispersal, and are capable of variable rate applications. In addition to our Kinsley facility, aerial support equipment at Larned and Ashland, Kansas allows for quick transitions of airplanes to best service producers across the area. Working closely with other applicators within the agricultural aviation industry, Tyree Ag has the ability to rely on other planes and pilots from across the country to assist with fast, timely applications during periods of major insect or disease outbreaks that threaten the yield and quality of area crops.